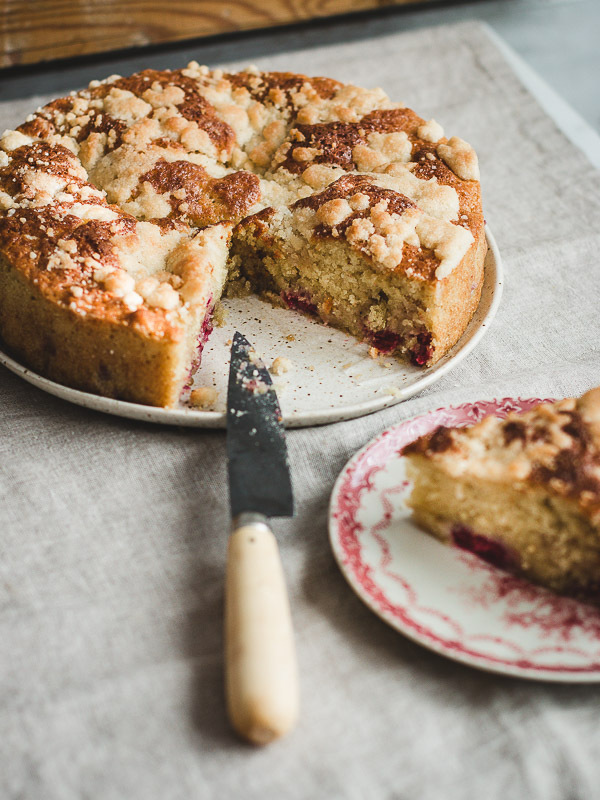 Raspberry Crumb Cake - Pretty. Simple. Sweet. 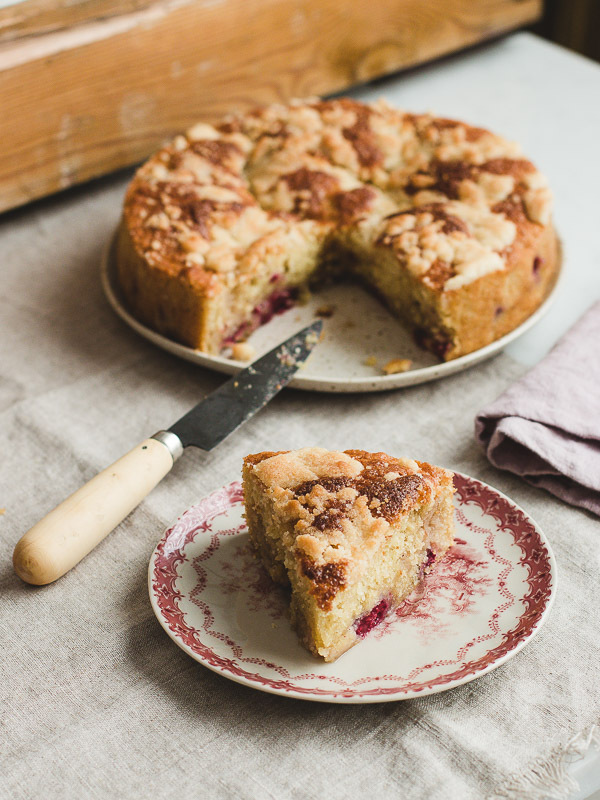 Simple and delicious cake made from a vanilla base cake, fresh raspberries, and irresistible buttery crumbs. I love all kind of cakes—tall or short, heavy or light, chocolate or fruit—yet there’s something about classic, simple cakes that feel homey and guilt-free when eaten for breakfast or snacking on 2 pieces. There are many textures and flavors to this cake. It’s layered first with a moist vanilla cake, then with fresh raspberries, and lastly a sprinkle of the most delicious crumbs on top. Berries have a tendency to sink into the batter while baking. Mixing them with a bit of flour or sugar usually helps prevent that. My raspberries sank this time because I skipped that step, but sometimes they do stay on top without sinking much. Either way, the cake will look pretty and taste the same. When I first experimented with this cake, I used my favorite sponge cake as a base, but since the batter was too light, the heavy crumbs sank into the batter during baking. I now use a different cake base recipe that has enough body to hold those crumbs. 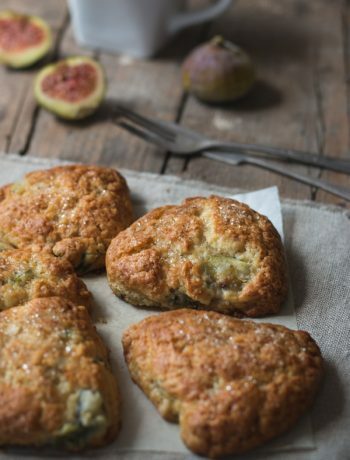 When making the crumbs, mix until either small or large crumbs form, whichever you prefer. To make the crumbs: In a medium bowl mix together flour, sugar, and cinnamon. Add butter and mix using a pastry cutter, fork, or your fingertips until the mixture is uniformly moistened and crumbs begin to form. Set aside. To make the cake: Adjust oven rack to middle position and preheat to 340F/170C. Grease a 9-inch round cake pan. Set aside. In a medium bowl mix together flour, baking powder, and salt until combined. Set aside. 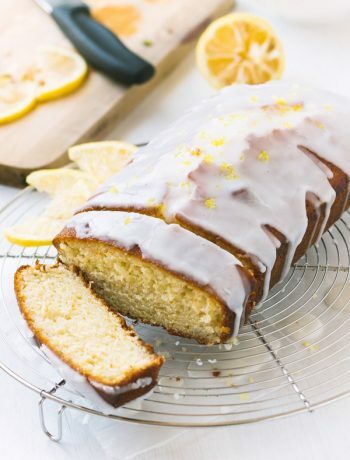 In a standing mixer fitted with the paddle attachment, beat together butter, sugar, and lemon zest on medium speed until light and fluffy, about 3-4 minutes. Scrape down the sides and bottom of the bowl as needed. Add egg and beat until combined. Add half of the flour mixture and beat on low speed just until combined. Beat in heavy cream and vanilla just until combined, followed by the rest of the flour mixture. Do not overmix. Scrape batter into prepared pan and smooth the top. 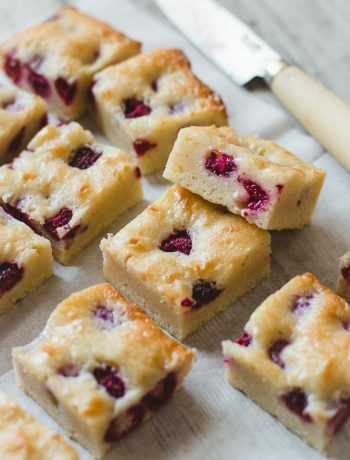 Scatter raspberries evenly over the top of the batter (don’t press them in as they tend to sink during baking). Sprinkle crumb mixture over the raspberries. Bake for 45 minutes or until cake is golden brown, firm to the touch, and a skewer inserted into the center comes out clean. If the top is browning too fast while baking, cover pan loosely with aluminum foil. Allow cake to cool completely on a wire rack. Serve at room temperature. Cake can be kept, covered tightly, at room temperature or in the fridge for up to 3 days. I do love a good crumb cake. It makes me feel less guilty for eating it for breakfast as opposed to a cake with frosting on it. I actually like the way the cake looks with the sunken raspberries. It’s a very pretty visual effect!